Delicate seasoning, sesame seeds and crunchy vegetables give the crispy fried salmon an exquisite aroma. The fish is served on a bed of noodles. Place the rice noodles in a bowl, pour over boiling water and leave to absorb for approx. 10 mins., rinse in cold water, drain. Mix the sesame seeds with the oil, toss the fish in the seeds. Fry the salmon in a non-stick frying pan for approx. 2 mins. on each side, season with salt. Remove, cover and keep warm. Heat the oil in the same pan. Stir fry the onions, chilli, carrots and Swiss chard for approx. 4 mins. Add the soy sauce and simmer for approx. 1 min. Add the vinegar and noodles, season with salt, heat through. 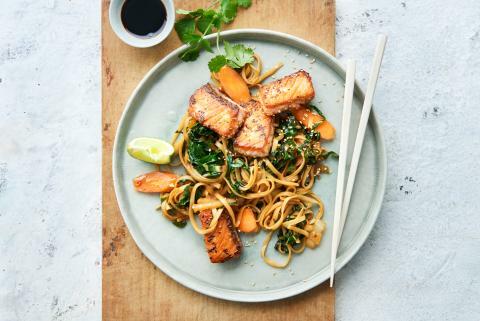 Plate up the noodles, top with the salmon, lime and coriander. Helles Zitronengelb mit eleganter Perlage, in der Nase fein duftend nach weissen Blüten, Traubenzucker, kandierten Zitronen, am Gaumen feincremiges Mousse, aromatisch nach exotischen Früchten und erfrischendem Abgang.